Mario has gone completely crazy and is journeying through the countryside in this hot game! In Rambo Mario Bike there are 5 missions- in each case you must survive and reach the finish line. 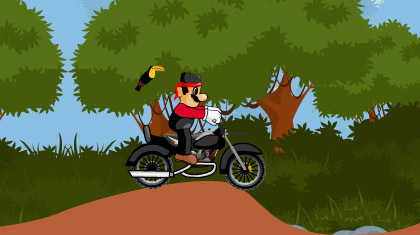 Mario has traded his plumber hat for a chic red headband (making him look like a Rambo rockstar) and travels on a sleek, black Harley Davidson through the land. You just have to be careful not to fall off! The game is played with the arrow keys. The up arrow is the accelerator. Use the left and right arrow buttons to adjust balance and turn yourself in the air. The down arrow key is the brake or sometimes the reverse, if necessary. If you get stuck in one place and cannot proceed, you can press R once and the mission will restart. It is imperative that you click GO on the main screen to begin the game. A very important tip is that if you are going very slowly, you can do all five adventures without great difficulty. It only becomes really hard when you attempt to drive very quickly without making mistakes. Unfortunately, there are only 5 options in Rambo Mario Bike and if you drive slowly, the game is not too much of a struggle. The sound is okay and Mario looks really good in his rocker outfit. A little Mario game for a fairly small break, but if you want to play for a long time, the game has less entertainment value. Unfortunately, the game is too short, even though Mario looks good.